The Museum’s entrance seems pretty nondescript, something easily missed if you weren’t hunting for it, like we were. Once inside, a small lobby with some souvenirs for sale begins the introduction to Henrik Ibsen (1828-1906), along with a bubbly guide who offered to include us in a tour of the historical apartment above. Ibsen rented this large apartment to lure his wife, Suzannah, back into his life. Ibsen had returned to Kristiania (the city’s name until 1905) in 1891 after living an ex-pat’s life for 27 years. By now he was a celebrated author of plays and novels and now had the means to live grandly; however Suzannah, who suffered from the cold and damp, refused to live in the first apartment he rented, so off she went ending up in Italy for her health. In spite of having young female groupies, (evidently they use to stand outside for glimpses of the noted playwright in hopes of catching his eye and currying his favor for parts) some of whom became extremely close to Ibsen, (some say ‘too close’)–he missed his wife. Which is how he ended up living in one of the most exclusive apartments in the city. 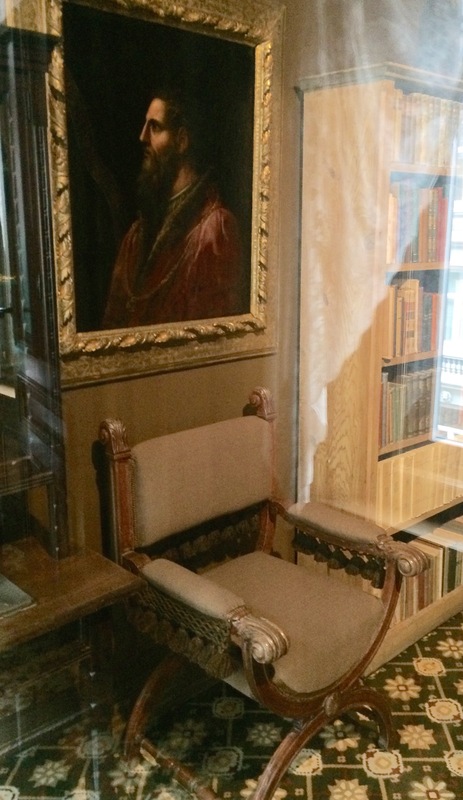 At one time the contents of the home had been scattered among their heirs, beginning with their only child, Siguard Ibsen, and several museums. 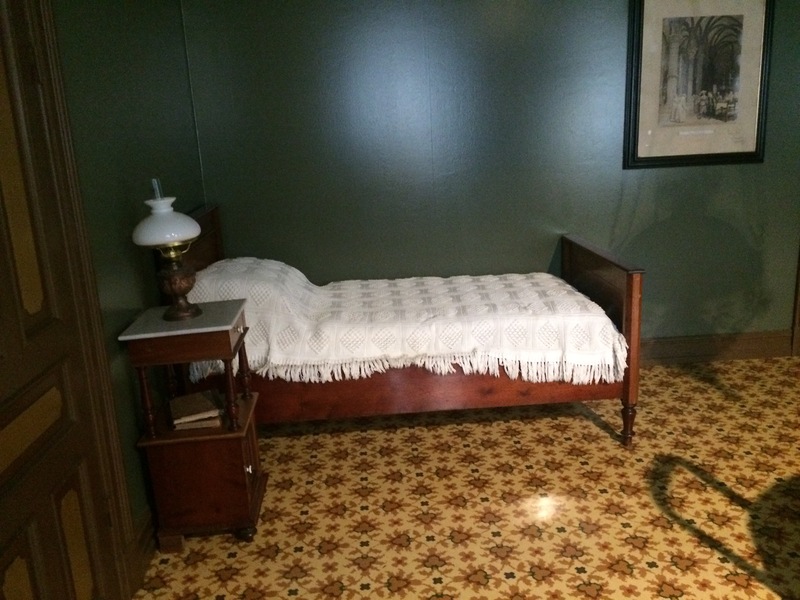 and his bedroom (at then end of this row of rooms) where he died after six years of multiple strokes beginning in 1900 left him not always ‘there’. His last words “To the Contrary!” were spoken upon hearing his nurse tell his visitor he was feeling better. He described all of the above in a June 21st 1895 letter to Suzannah ending with “… As I say, I think you will be pleased.”. 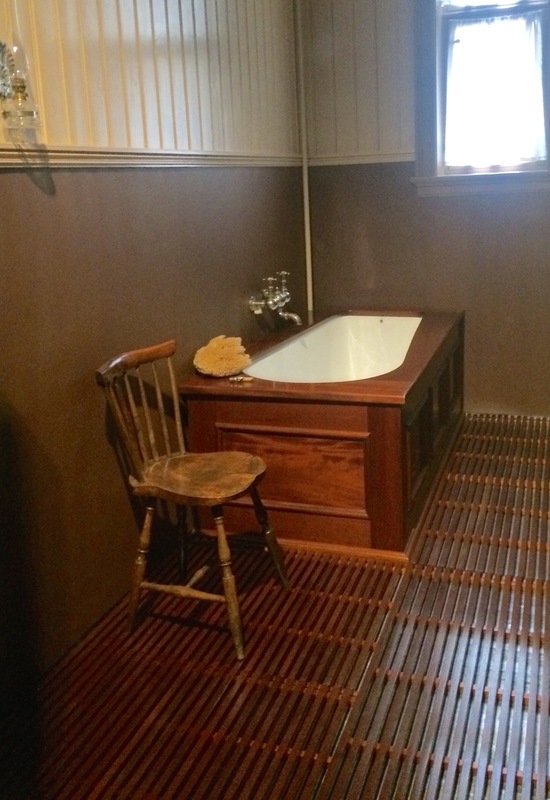 There was also a bathtub, which he loved, a gift from his daughter-in-law. And, in most of the rooms we saw one of these: a beautifully wrought large heater. Ibsen also entered into his first love affair with a female servant ten years his senior. The result was a child for whom Ibsen reluctantly paid child-support for 14 years but with whom he had no contact. In 1862 the Kristiania Norske Theater folded. A travel grant afforded Ibsen a year in Italy, where he escaped the lack of recognition, a poor finanical situation, and a period of depression and alcoholism he experienced in Norway. Ibsen came to see Norway as a restrictive and staid environment compared to the freedom he felt in Italy. Edvard Grieg, another famous Norwegian musician, put the latter to music, which is probably how a lot of later generations came to know the title “Peer Gynt”. Not being a theater major (or minor, for that matter) I learned why Ibsen has the title ‘father of modern drama’. During Ibsen’s early days the actors spoke their lines while standing in a semi-circle close to the footlights so they were seen, whispering asides to the audience when wanting to convey unspoken thoughts. 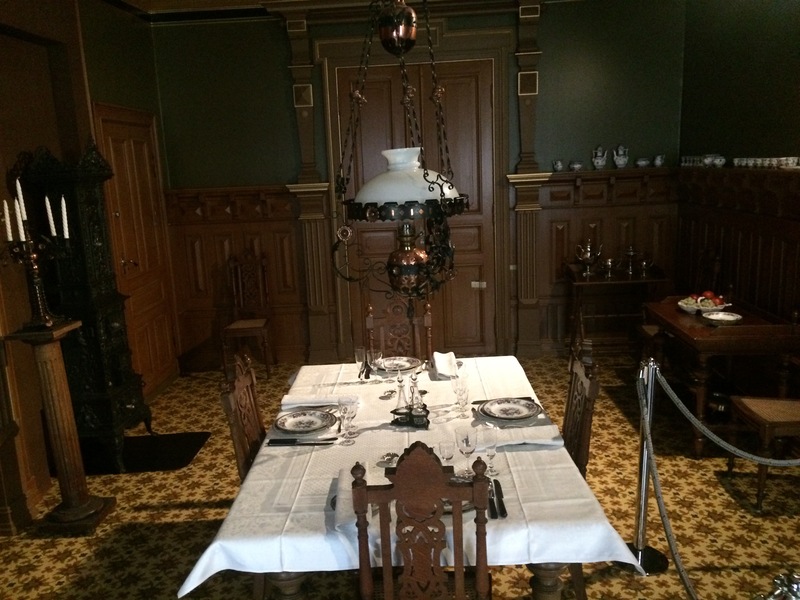 Thanks to Ibsen, actors began to engage with one another and roam a set designed with realistic details. Ibsen stayed abroad with his wife and son until returning as a successful playwright in 1891. His personality, described as talkative and outgoing as a youth, morphed into an unapproachable figure, some say a ‘Sphinx’. With the safety net of wealth and fame, Ibsen cultivated this image saying “I’d rather ask; my job’s not explanations”. Yet, he had a liberal outlook in life and believed in progress. This view could have been a rebellion against religious dogma, after seeing his mother transformed from an open and warm parent into a strict Christian. He eventually had very little contact with his parents and siblings, some of whom also converted to puritanism. And, they weren’t the only artists captivated by this man. John Lennon, too, admired the author. 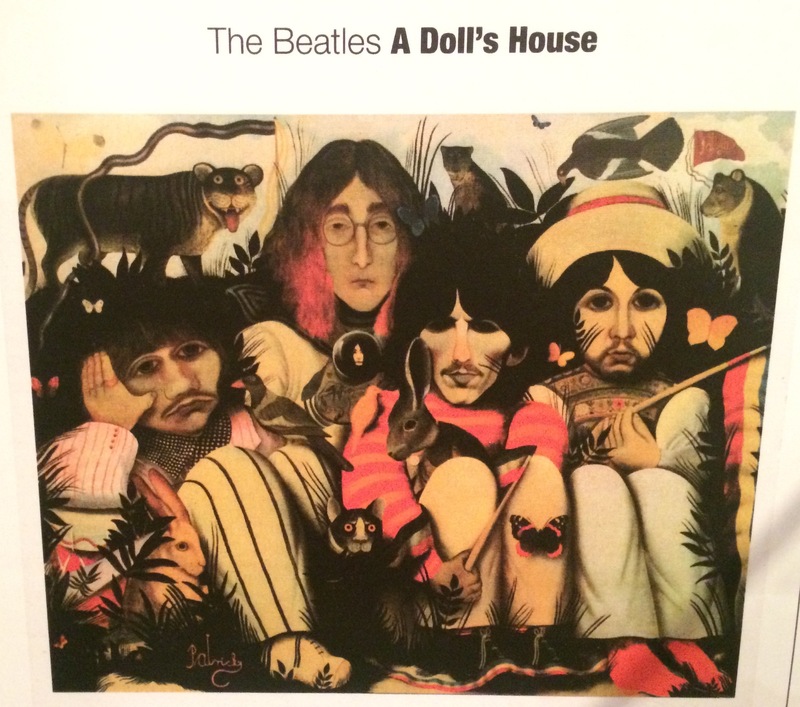 A small display explains how Yoko Ono introduced Lennon to Ibsen’s work including “A Doll’s House”, which John later borrowed as the title for one of the Beatles’ albums. It turns another band had used that name prior to the Beatles’ release, so the album became simply the “White Album”. Another interesting factoid discovered in this tucked-away museum of one of Norway’s most famous personages. Our daily ferry trip across the harbor landed us close to the Nobel Peace Center, another site on our ‘must-see’ list. Having visited the Nobel Museum in Stockholm earlier this year with our friend Kathryn I was curious how this center would present its laureates. The lobby offers a cafe (and free wifi…) and a gift shop filled with fair-trade items and books on the laureates and related topics (I love museum shops but, then again, I’m partial due to my mom’s work in a Museum shop). 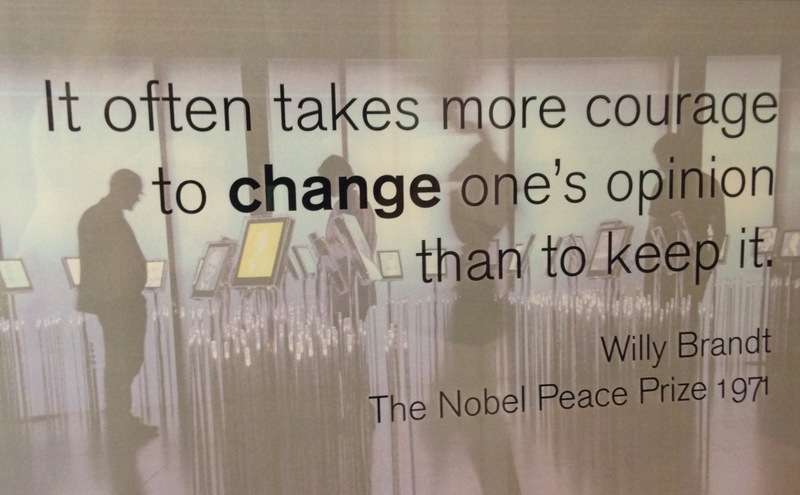 A permanent exhibit called The Nobel Field displays all the peace prize recipients since 1901. You could spend a whole day simply wandering through the impressive stories of those advocating for peace. 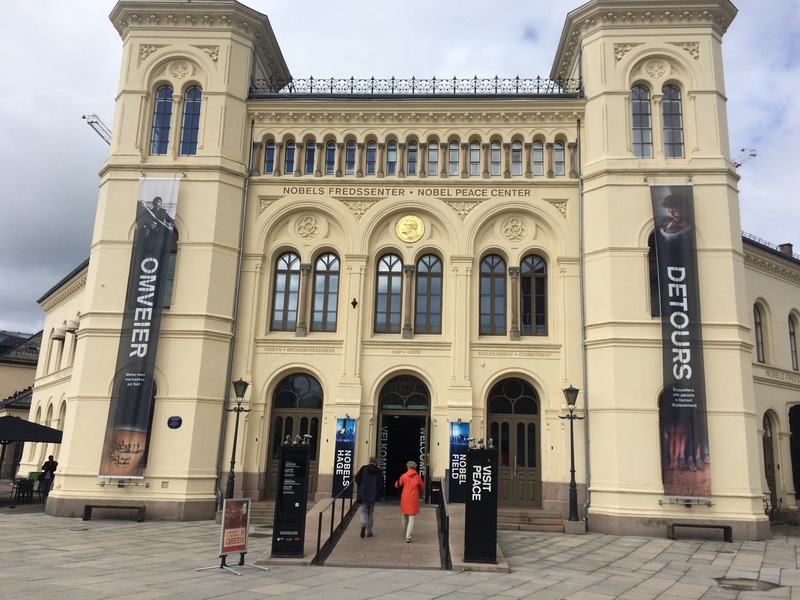 Two other permanent exhibist are The Wall Papers, which cover even more details on the laureates, and The Nobel Chamber, an overview of Alfred Nobel’s life that we knew from our tour in Stockholm. Several temporary displays include ‘Detours’, a photographic essay on forced displacement throughout the world; and ’Hope Over Fear’ about 2016’s winner, Columbian President Juan Manuel Santos. The awarding of the latter caused some controversy since the peace agreement between the government and the Revolutionay Armed Forces of Columbia (FARC) ultimately lost in a referendum vote October 2nd. Not knowing the background of how FARC began (as a Robin-Hood gang of 48 who survived an attack in 1964 by the government on a communist-controlled commune) and evolved (into a corrupt and violet guerrila force of 20,000 using cocaine and kidnapping to fuel their resistance), the exhibit explained how Santos, a former Minister of Defense in charge of obliterating FARC, has used his six years as president to negotiate an end to Columbia’s civil war. A month after citizens voted ‘no’ to that negotiated peace agreement the national assembly of 30 representatives approved a new agreement with FARC. And, if one guerilla movement isn’t enough, the Columbian government is also meeting wtih the National Liberation Army (ELN), a rival to FARC. For those interested in an excellent recounting of Columbia’s journey through those years, please refer to the “Hope Over Fear” brochure pages below. I learned a lot. Just wish I could include the photos by Mads Nissen accompanying the text written by Dorrit Saietz. The Nobel Peace Committee framed the 2016 award to Santos as a work-in-progress – the real work has only just begun. What a sight! Constructed 2000-08 this stunning landscape of sloping white marble houses the largest music and stage institution in Norway. Like Bilboa’s Guggenheim Museum and Doha’s Museum of Islamic Art, whose exteriors serve as parks for all to enjoy, the Norwegian National Opera & Ballet truly is a building for the public. As both a perfomance house and a respite from the city, you can stretch your legs, sunbathe or simply take in the harbor view. 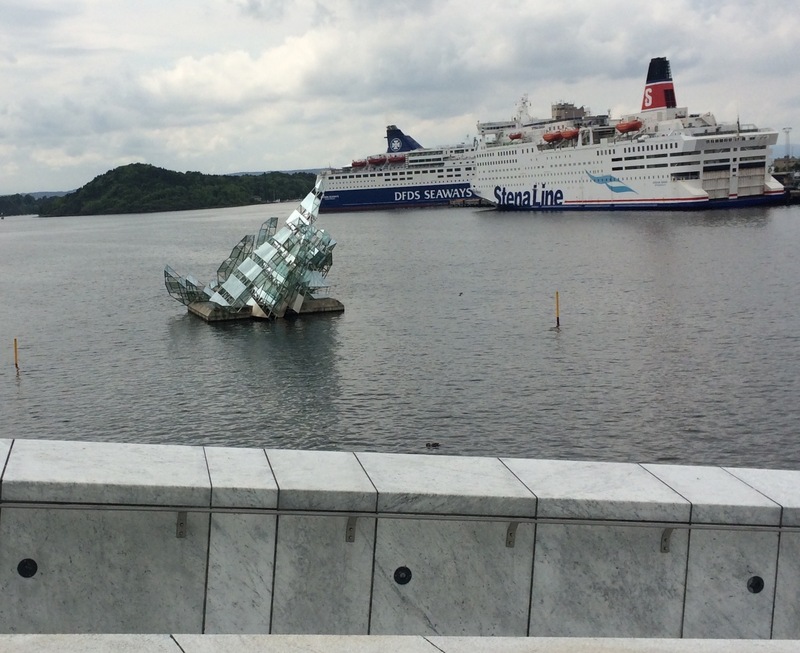 and spotted the floating glass & steel iceberg sculpture “She Lies” that twirls in the wind. Once inside we strolled around the airy ground floor, even checked our email on their free wifi. With an hour to go before the ballet started (“Don Quioxte”) we ate our bag lunch on benches provided. For a building offering rather lofty cultural events (ballet and opera, among others) they have managed to create a welcoming atmosphere, one that makes you feel as if you’ve been invited to a neighbor’s backyard BBQ. Something I didn’t expect from such a stunning sheath of marble, its interior dressed with beautiful Scandinavian wood. Lunch finished, we headed to our ‘seats’, which were standing room since the difference in price was ten-fold. We found ourselves next to six other standees, one being a Norwegian who’s been living in England for over 20 years but returns annually for a visit (and, yes, Anne, I did start the conversation… :) ). The show began and we fell under its spell as lithe and dramatic ballerinas and male dancers leaped and swirled their way across the stage. Both Max and I enjoy musicals, and this ballet didn’t disappoint. In spite of no dialogue the expressive body language of the dancers easily conveyed the story. At the end of the ballet the director announced the audience had just seen the last performance ever of what many Norwegians consider the best Don Quixote, and we watched as the lead character took his last bow as the theater erupted with a standing ovation. After three acts, two intermissions, and a large glass of wine each we exited this performance center happily sated on, for us, a unique experience in a world-class city.